“We will not allow anyone to touch Egypt’s share of Nile Water. This is a matter of life and death for Egypt,” the country’s Mursi-era water resources and irrigation minister, Mohamed Bahaa El-Din, said last June during a high-level meeting chaired by now-ousted Islamist president Mohamed Mursi that was accidentally—and famously—broadcast on live television. “We do not have the luxury of giving up any drop of water from Egypt’s share of Nile water,” reiterated Egypt’s current water minister, Mohamed Abdel Moteleb, earlier this year. It is clear that Ethiopia’s Renaissance Dam project continues to provoke feelings of concern across Egypt. That concern has been edging towards a state of mass hysteria following reports that a third of construction has now been completed as the 2017 completion date draws ever closer. But away from all the political and media posturing, just how much of an actual threat does the dam represent to Egyptian water security? According to the UN, Egypt could become a “water scarce” country by 2025. And, whatever the differences between Cairo and Addis Ababa—and they are myriad—Egypt’s fundamental connection to the Nile is perhaps the only thing all Egyptians can agree on. 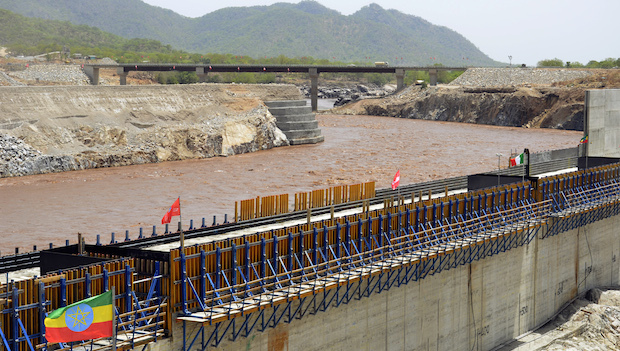 The Grand Ethiopian Renaissance Dam, to give the project its full name, will stand 550 feet (170 meters) high and be 5,900 feet (1,800 meters) wide, holding a reservoir of 16.6 trillion gallons (63 billion cubic meters) of water and boasting a 6,000-megawatt production capacity. Approximately 8,500 people are working on this 4.7 billion US dollar project, with construction taking place around the clock. All in all, the dam will be the largest in Africa and thirteenth largest in the world, dwarfing Egypt’s own not-so-high-anymore High Dam. It is true that most analysis—though not all—agrees that Egypt’s share of Nile waters will be negatively affected by the dam. But, as indicated above, the political dimensions of this issue are taking precedent over ecological and technical details, and so any technical claims that the dam will be good or bad for Egypt must be viewed through a political lens. But Egypt, whether under Bahaa El-Din or Abdel Moteleb, Mursi or Sisi, continues to lose on the political front as well. Addis Ababa announced the project just two months after the revolution, while Cairo only began dealing with the issue in earnest after Mursi came to power. Even then, it kept dropping the ball. Mursi-era water minister Bahaa El-Din moved from expressing “surprise” at the news (at least eighteen months after the project had been publicly announced) to denying that it would affect Egypt’s share of Nile water to beating his chest and framing the issue as an existential crisis for the post-revolutionary country. Then there was the behind-closed-doors meeting, chaired by Mursi, which was accidentally broadcast live on television in which senior Egyptian politicians mulled destabilizing the Ethiopian government and physically sabotaging or attacking the dam. Less than two months later, Mursi was in custody and a new president was in power. Has the current government fared any better? In short, the answer is no. Abdel Moteleb has also flip-flopped on the issue, from attempting to reassure the public that Egypt’s share of the Nile will not be affected by the dam to warning that “all options and scenarios are open.” Amid all this chest-beating, almost exclusively for domestic consumption and political point-scoring, the third round of technical negotiations between the Egyptian, Sudanese and Ethiopian water resources ministers broke down in January. Sudan has since taken a step back from the issue, leaving Egypt as the sole downstream country that objects to the ambitious project. Cairo has subsequently ramped up its diplomatic efforts to halt the construction of the dam, appealing directly to the Italian company that won the construction contract, filing reports with the EU, and seeking to obtain international help to shut the project down. In addition to this, rumors and reports are currently emerging among Egyptians—who are renowned lovers of conspiracy theories—that the dam is being funded by Turkey, Qatar, Israel, Hamas, the Muslim Brotherhood, or some combination thereof. According to WikiLeaks, former President Mubarak had planned to launch air strikes on any putative upstream dam if diplomatic options failed. Diplomatic options have failed, but Egypt today is in no position to start a war while Ethiopia is basking in its security victories and economic boom. Most Western analysts, misunderstanding both Egypt’s and Ethiopia’s deep cultural and national connection to the Nile, believe that the solution to the Grand Ethiopian Renaissance Dam project is simple: you just replace the word “Ethiopian” with “African.” This would prompt Egypt to contribute to the dam’s funding and obtain much-needed water and electricity guarantees in return. This solution is reasonable, logical and sound—which means, given the state of hysteria and chaos that has dominated Egypt since the revolution, it is unlikely to come to pass. Egyptians are fond of quoting the aphorism of ancient Greek historian Herodotus that “Egypt is the gift of the Nile.” Ethiopians have developed an aphorism of their own: “The Nile is the gift of Ethiopia.” As these two African powerhouses— Ethiopia in the ascendency, and Egypt economically and politically flailing—continue to wrangle over the lifeblood of the continent, how much longer will it be until Egypt reaches the point of no return?